The lone star quilt is finished. It’s so large that I decided to take pictures while it was still on the machine. You can see in this picture that it’s pretty flat and evenly quilted. The border got a curling feather design. This is the center of the setting squares. I did meandering around the rose to make it show up better. The thread (stitching) is not what makes a design show up…. it’s the negative space created by the thread that your eye sees. 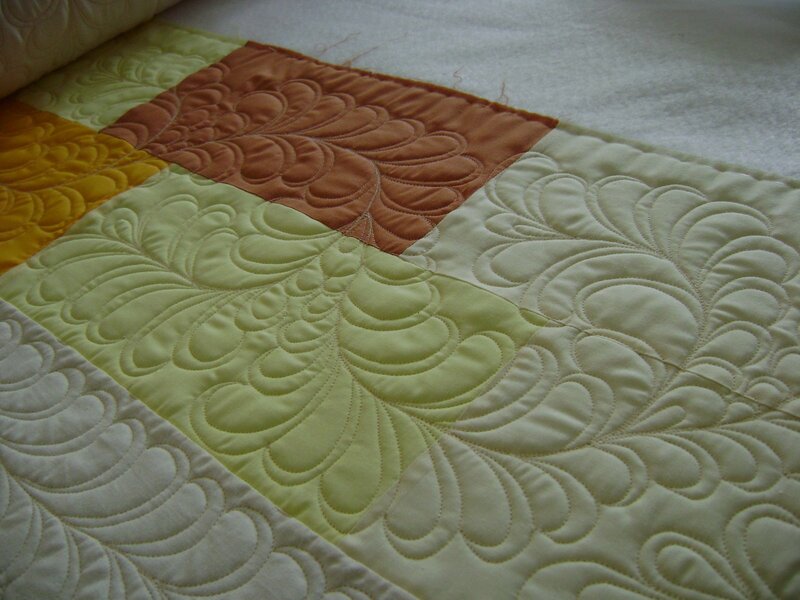 The outside of edge of the squares also have a feather design to frame the rose. The rose was done on the setting triangles too. The corners of the setting triangles. The other side of the setting triangles. Now for the star points. Each individual diamond got a design in them. There is a stop and start in each of the lined diamonds and from corner to corner design in the other diamonds. No stops and starts on each one of those. 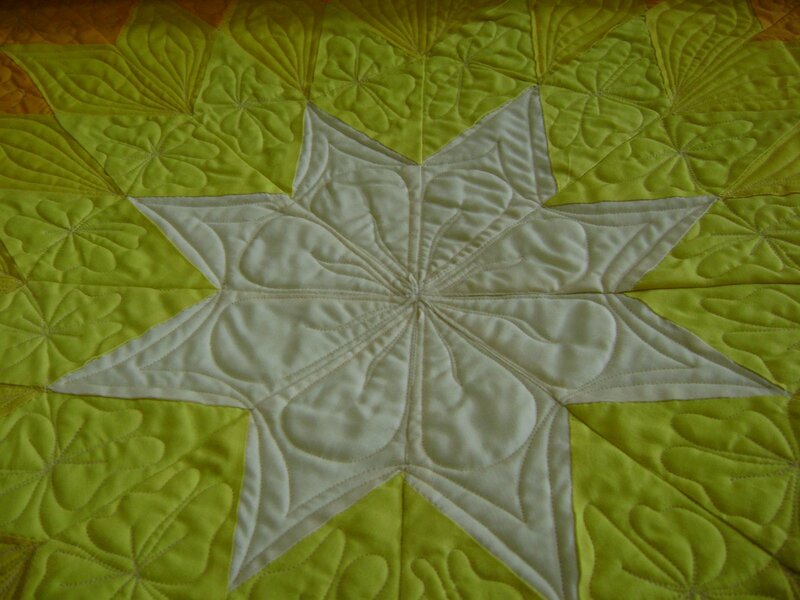 I repeated the designs in the same colors going toward the center of the star. 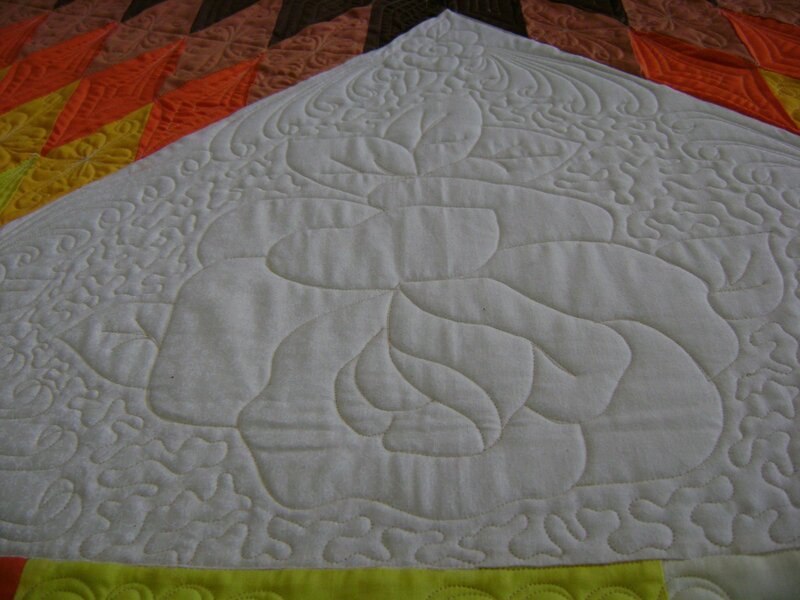 As you can see there is still some fullness but it’s spread out fairly even throughout the quilt. Another view so you can see how I worked in the extra fullness. 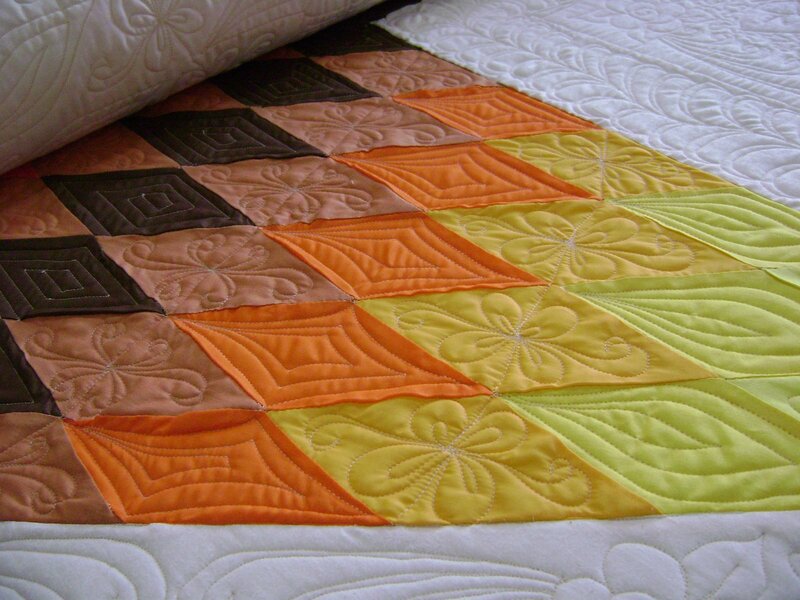 Washing the quilt should take even more of the fullness. Washing takes out the sizing and the fabric relaxes. Showing you more of the designs in the star points. We finally get to the center of the star…. the place where I had so much trouble before. I think it turned out rather nice. 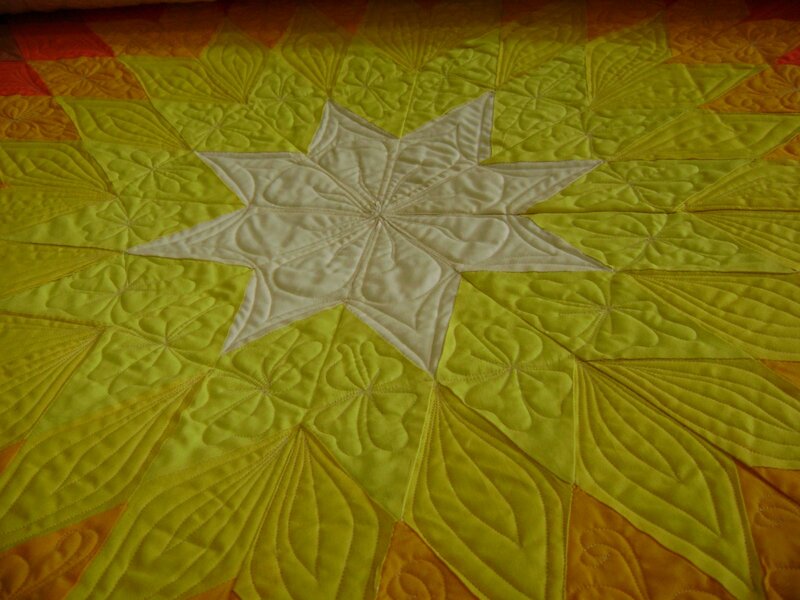 The reason I did a larger more open design in the center is because heavy quilting draws up the quilt. 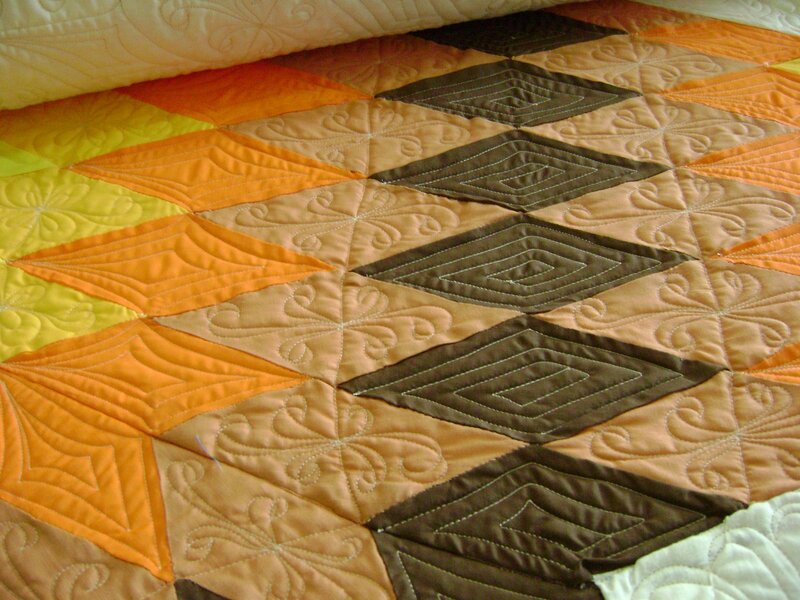 This area was already too tight and heavy quilting would have made it worse. Loose open quilting next to heavier quilting gave this area a balance. Here is a closer view of the center. I had enough time to finish the binding so I called the owner to tell her it was finally finished. I thought she would be happy but it turns out that she really wanted her husband to see the quilt done before he passed away. It had been his mother’s unfinished quilt not the woman’s mother. The husband passed away last week. Need I say more? Mental picture….. a dog that’s cowering and slinking to a corner because the owner is scolding him. Now picture me….. I’m slinking to my guilty corner for a couple of days. Wow! 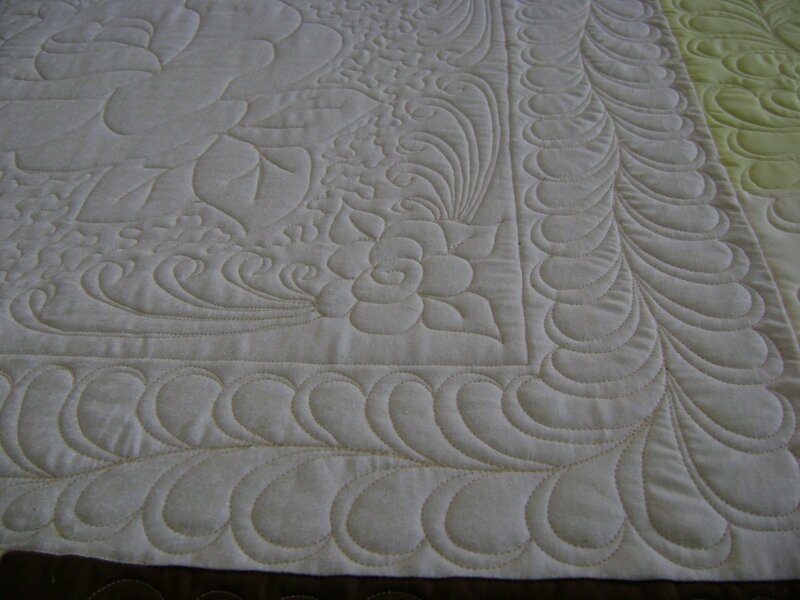 The quilting is simply stunning. 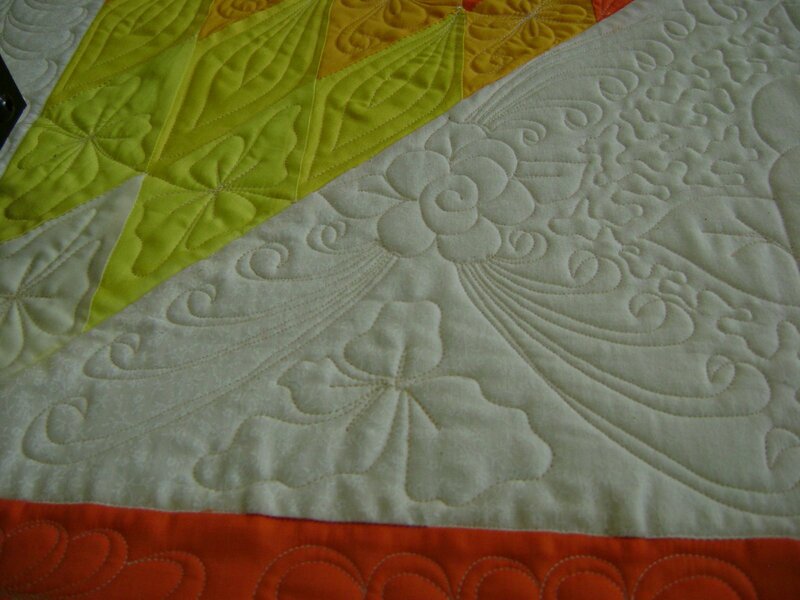 The quilting is beautiful. Do you do it all freehand or do you mark at all. 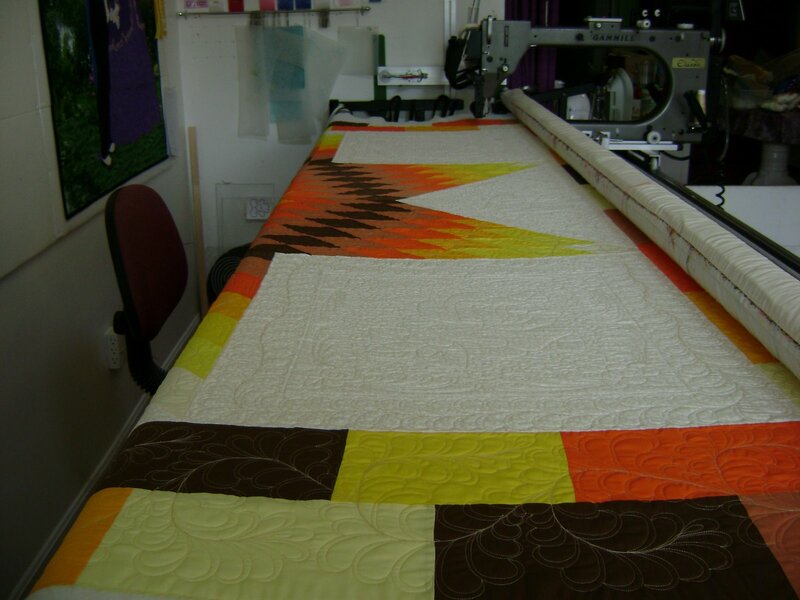 I am a pretty new longarm quilter and am loving it. 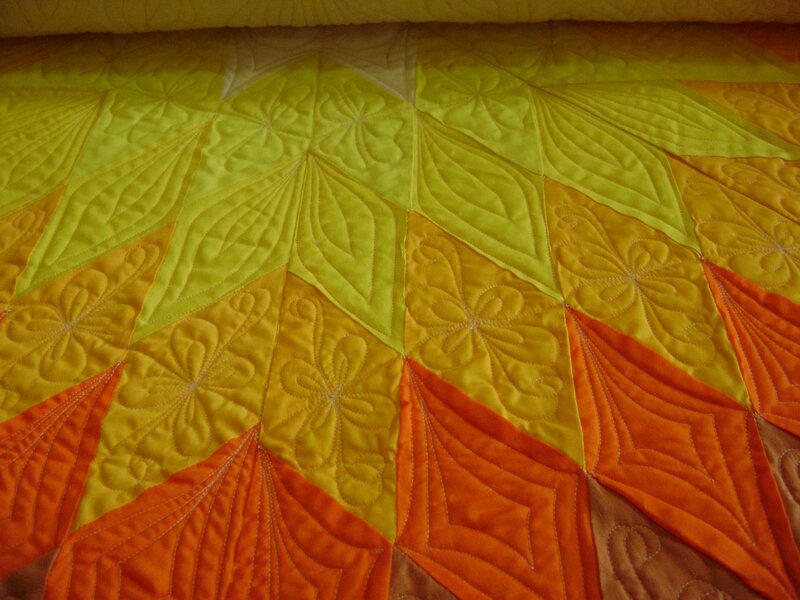 That quilt..pardon the pun.. is to die for. It’s SO stunning and beautiful. I love it. Anita you did an awesome job on the lonestar quilt! How were you to know the ladies husband would pass away…so sad. But you did beautifully! Get out of the guilty corner right now!! You did the best you could to get it done. IMHO you went way beyond the call of duty to turn a mess into something to be proud of. It's not your fault the guy died & his widow is being totally insensitive to make you feel guilty. I am so excited you finished that star quilt.. and it is ABSOLUTELY BEAUTIFUL.. and yes, i can also feel how you feel right now. How can such extreme joy be turned into the blues so quickly? it IS WONDERFUL.. you did an EXCELLENT job and you gave it your VERY BEST.. be PROUD of it.. and i am certain he IS seeing it. from wherever his spirit is now. I am sure that you feel some quilt but it is unwarranted. The woman was problably upset about her husband’s death and was not trying to “scold” you. She should not have waited so long to bring you the quilt but then none of us knows what the future willl bring! 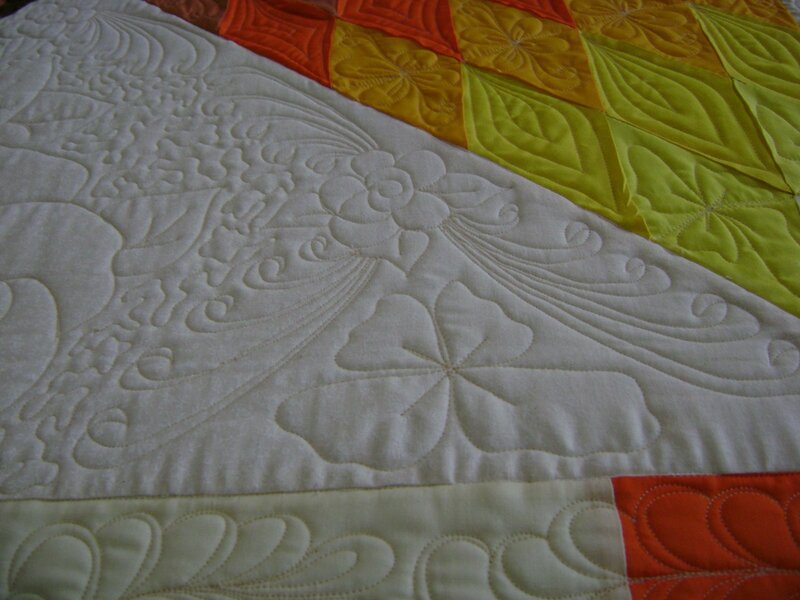 Your quilting is just amazing to me – especially the way you come up with so many freehand designs for each area. 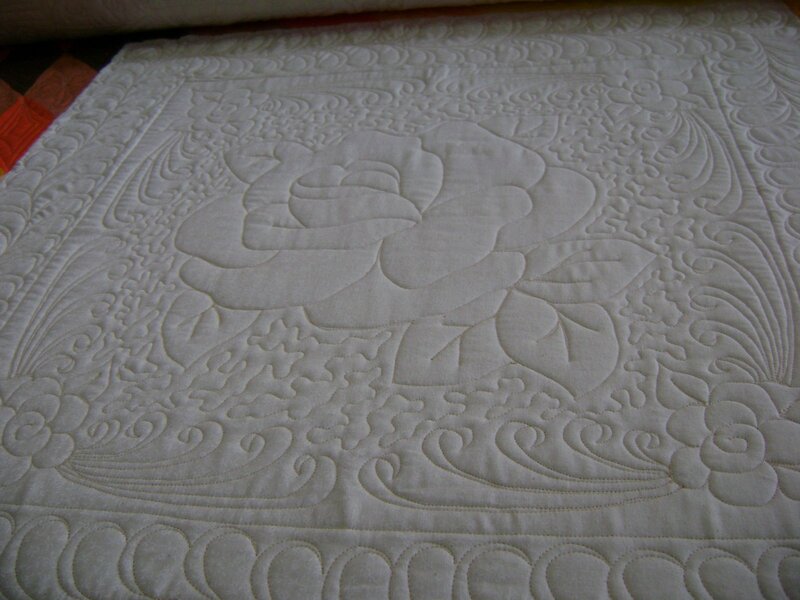 Looking at this quilt makes me think that there is no way you could sharge someone what all that work is worth. 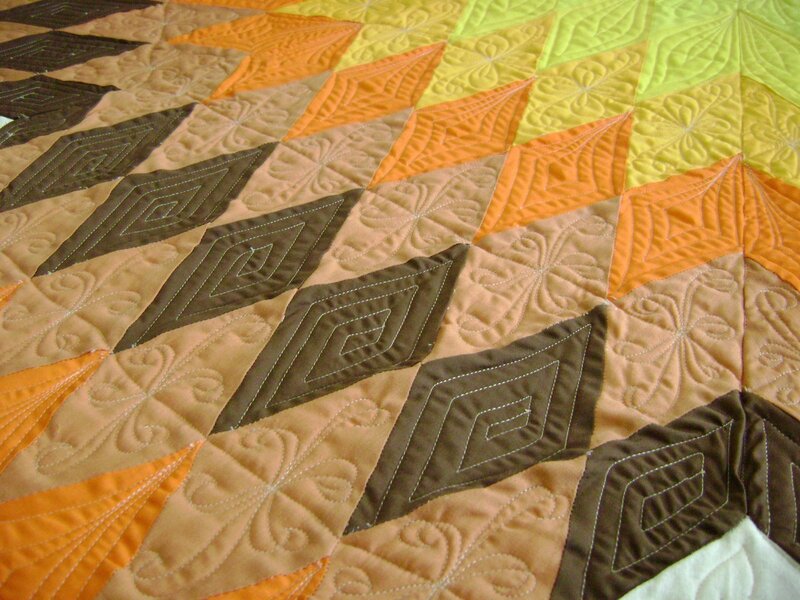 You really put your heart into all your quilting and it shows. That quilt is a masterpiece. Please stop cowering. If that poor man died last week, chances are he wasn’t going to be all that thrilled about the quilt when he saw it. I know the quilt owner is grieving but after all the work you put into it, you have nothing to be guilty about. If you’d gotten it done just a few days earlier, you’d be a hero in her eyes. The husband didn’t miss a thing. Let it go. It is gorgeous. 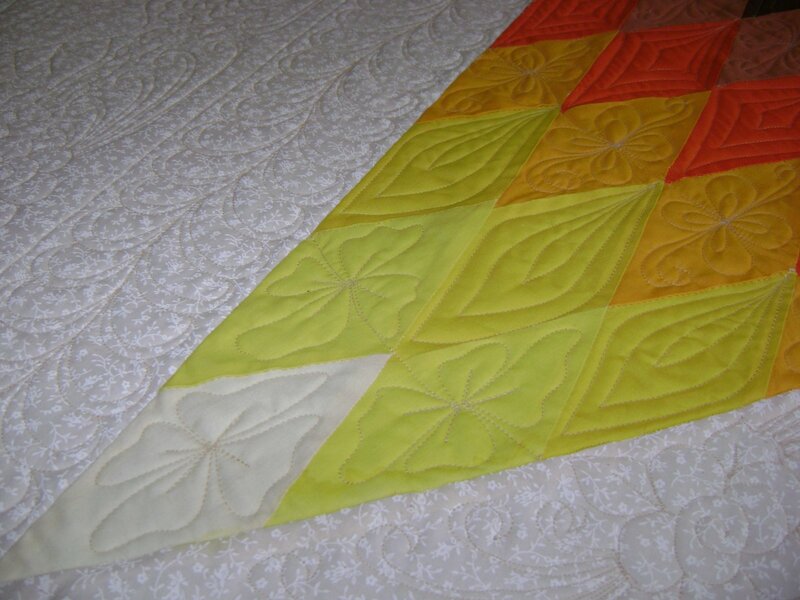 This entry was posted on May 1, 2009 by Anita in Issue quilts 2009, Quilts of 2009, Vintage tops.